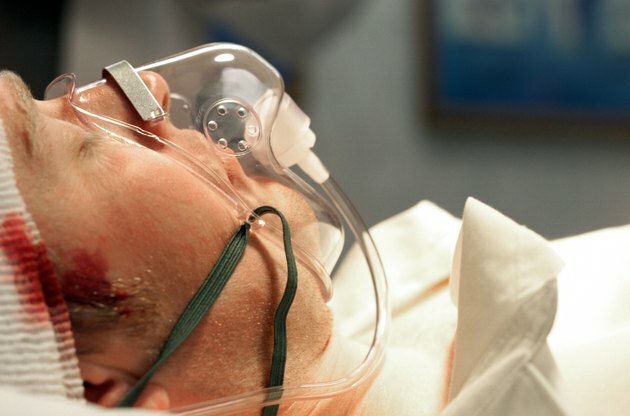 Blunt head trauma can happen from a blow to the head, and result in serious damage to the brain. According to the National Institutes of Health, the impact can range from a minor bump to severe brain injury. According to braininjury.com, the majority of traumatic brain injuries (61 percent) occurs due to traffic accidents. Even if the head trauma does not result in an open wound, injury can occur to the brain. The effects of blunt head trauma are irreversible and severe, and can interfere with normal brain function. Two types of head trauma can occur: concussion and contusion. With a concussion, the brain is shaken, while a contusion causes direct injury to the brain. According to braininjury.com, the loss of consciousness from a blunt head trauma leads to even more damage to the brain. In addition, injury can occur to the opposite side of the brain—called contrecoupe—when the head is moving and hits a stationary object. This blunt force results in the opposite side of the brain pulling away from the skull and becoming injured. Blunt head trauma occurs from accidents; according to the National Institutes of Health, the most common causes of head injury are traffic accidents, sport injuries, physical assaults and falls. In sports, wearing a helmet can reduce the risk of head injury. Using proper restraining devices in the car can prevent head injury from occurring. Symptoms of blunt head trauma can either occur immediately after injury or develop slowly within a few hours or days. Severe symptoms that can arise from head injury include convulsion, changes in the pupils, inability to move one or more limbs, irritability, personality changes, unusual behavior, loss of consciousness, confusion, drowsiness, low breathing rate, drop in blood pressure, lack of coordination, severe headache, slurred speech, blurred vision, stiff neck and vomiting. Injury to the head can result in severe damage to the brain. According to the National Institutes of Health, serious head trauma can result in speech and language problems, coma, chronic headaches, paralysis, seizure, changes in sensation, and changes in hearing, vision, taste or smell. In addition, bleeding can occur within the brain, which can exacerbate brain damage. According to the National Institutes of Health, after a blunt head trauma, do not move the patient unless necessary. Do not clean any wounds, remove objects or shake the person if he seems dazed. Timing is essential, so call for medical attention immediately.